Take the Road less travelled. Wears Valley Road winds from Pigeon Forge, TN to Townsend, TN. This 15 mile road offers scenic views of the Great Smoky Mountains. Bordering the valley is Great Smoky Mountains National Park with its towering mountain peaks and lush foliage. 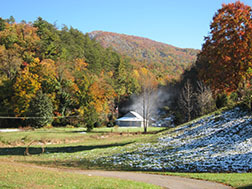 Picturesque pastures and farmland will take you into America's mountain life where game flourishes in the surrounding mountain forests and meadows--rabbits, opossums, squirrels, deer, bear, geese, wild ducks, quail. Fish are plentiful and the fishermen bring home rock bass, trout, and others. Bees are kept in homemade hives called bee gums. The honey is used often as a sweetener and also sold to obtain extra income. Potent corn whiskey is also made and sold to bring in more money for the family. Garden vegetables always include corn, white potatoes, sweet potatoes, squash, beans, pumpkins, and others. 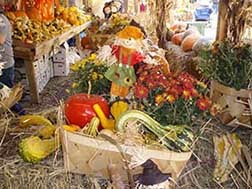 Enjoy photogenic foliage opportunities, great eats, and other hidden treasures including artisans and craft shops along Wears Valley Road. 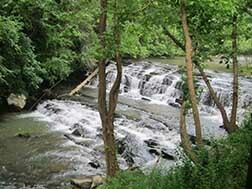 One of the Smoky Mountain's best kept secrets is Friendly Falls, located at Friendly Falls Restaurant.